A wiki is a collection of collaboratively authored web pages, a famous example of which is Wikipedia. 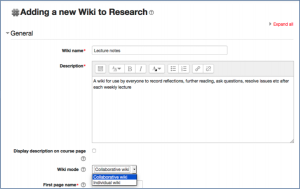 With Moodle’s wiki tool, you can set up a wiki for the whole class, for groups or for individual student use. It is also possible to have a wiki that only teachers can edit. 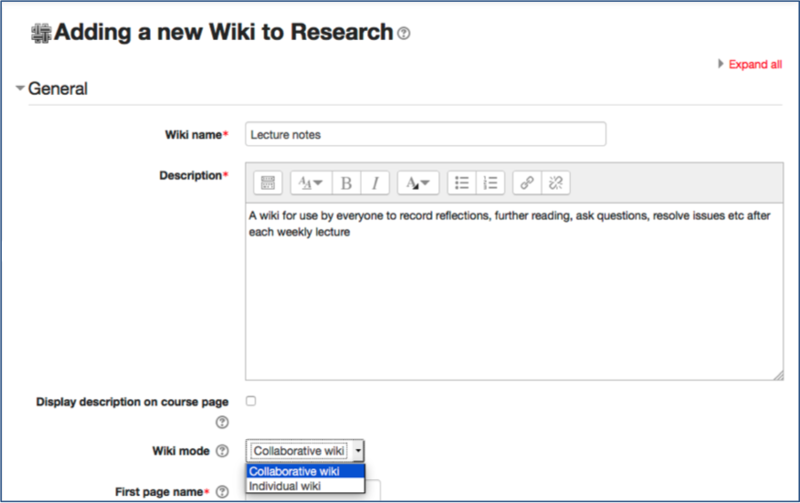 You might set up a wiki for the whole class to contribute notes to after every lecture or for groups to use for collaborative project work. 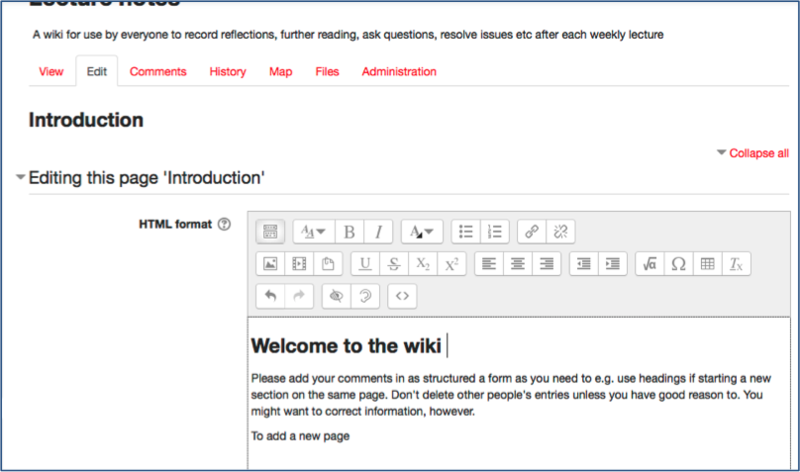 A wiki starts with a main page (or index) to which other pages can be added. As changes are made to the wiki, a History is kept where old versions can be viewed and restored if necessary. There is also a full record of all contributions. Go to the relevant course and Turn editing on. Select Add an activity or resource, choose Wiki and Add. Collaborative for all (or groups of students) to work on. 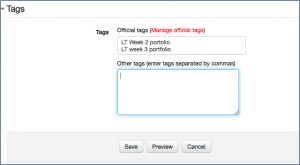 Provide a First page name, leave the other settings to default for a whole class wiki and Save. N.B. 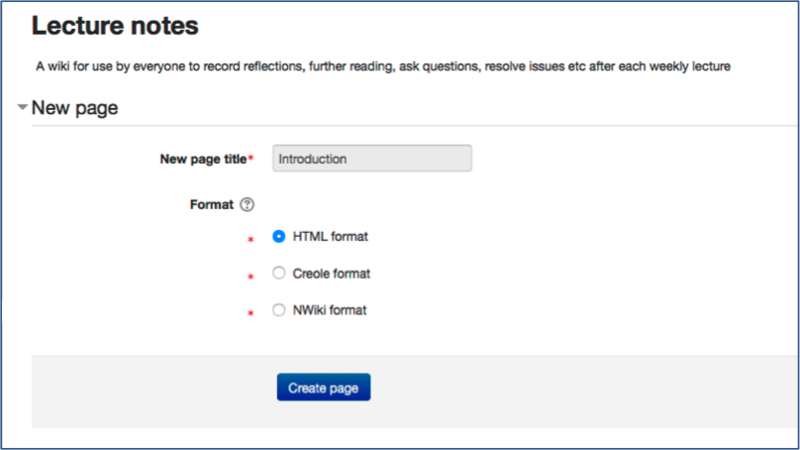 If you are setting up group wikis, select the relevant options in Common module settings (see Create and use groups and groupings). Once the wiki is set up, the link looks as follows. Click to start using it. When you open the wiki for the first time, you are prompted to create the first page with the name you gave it during set up. At this stage you can change the default format of HTML which is recommended for most purposes. (Click to find out about the other formats.) Click Create page to continue. It is a good idea to add some text to the opening page of the wiki e.g. a description of its purpose and guidelines on how to use it. This will make it less intimidating for students to embark on their own contributions. Note that wiki pages share the same editor as other Moodle tools. 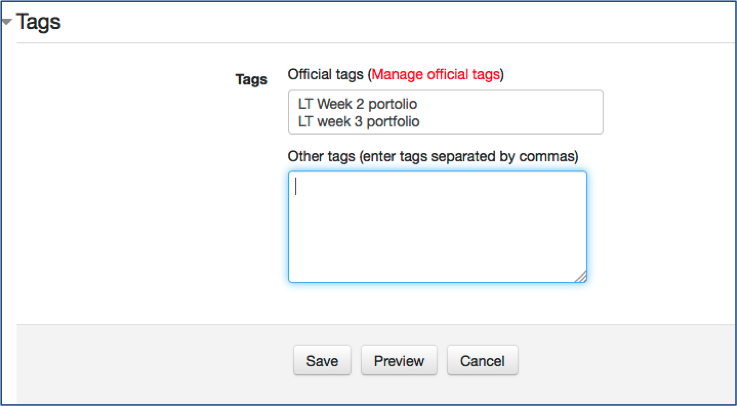 When you have added text, scroll down to add tags (these will be useful to find topics on a large wiki). Click Save or Preview. Having added a page in Edit mode, you are returned to View mode (see tabs at top of page). Comments – users can view and add comments. 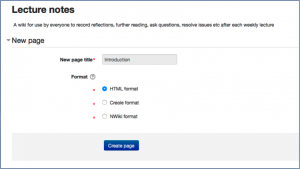 History – records all changes and is the page from which previous versions can be compared (and restored). Map – shows the structure of the wiki. Files – lists any files that have been attached to wiki pages. By default, only teachers can add files. 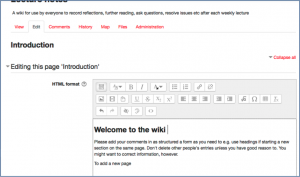 Administration – provides a means of tidying up wikis e.g. removing pages that are not linked (orphaned). 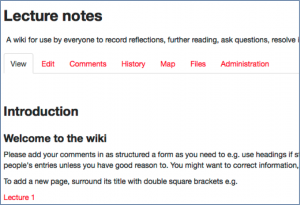 To add a new page to a wiki, select Edit on the initial page and add the title of the new page surrounded by double square brackets e.g. [[Lecture 1]] and Save. Once the page with the new page link is saved, the page title appears as a link. Click the link and you will be taken through the Create page process as in step 1 above. 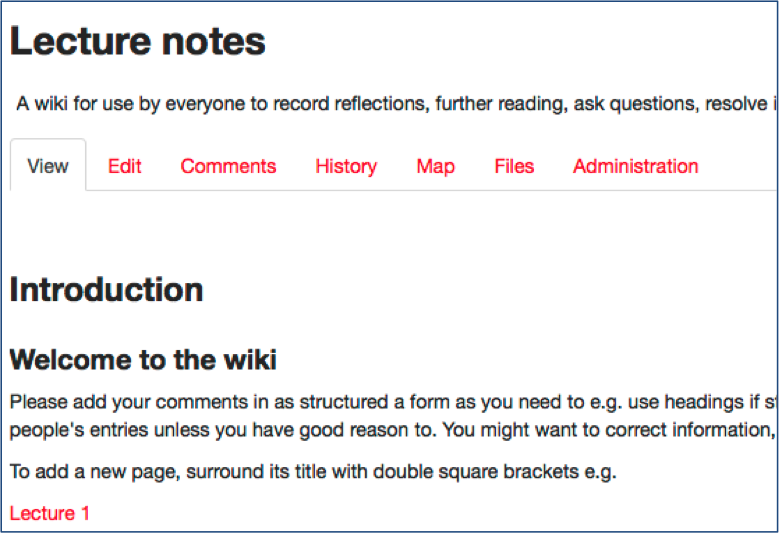 Once the wiki is in use and changes are made, you can use History to compare versions of a page. Open the relevant page of the wiki and click the History tab. This shows the different versions and who has created them. Click Compare selected to see the details. The versions are presented as below. To revert to an earlier version click Restore (to the right of the version number).